Currinda allows you to publicise your event program in your mobile event app. To begin setting up your event program, you must create ‘sessions‘ and allocate abstracts to sessions where applicable. Once sessions have been created and their abstracts have been allocated, the session details (Name, Times, etc) will be available within the mobile app and the allocated abstracts will be viewable. Click the Program tab on the LHS tabs menu. Click the green ‘Add New’ button at the top of the Sessions page. Populate all session-related information under the ‘Çreate a new session’. Note that 3 separate worksheets are provided under respective tabs: Basic; Content; and Catering. (Some fields may not be relevant/necessary for your session and may be left blank). Click the ‘Submit’ button to save your new Session. Now that a session has been saved, you can allocate abstracts to it. During your (earlier) session setup, you entered a numerical limit on the quantity of abstracts which can be allocated to the session. The Sessions list (see example below) shows this information, and also shows the number of remaining (unfilled) abstract places, under the heading ‘Remaining Slots String’. 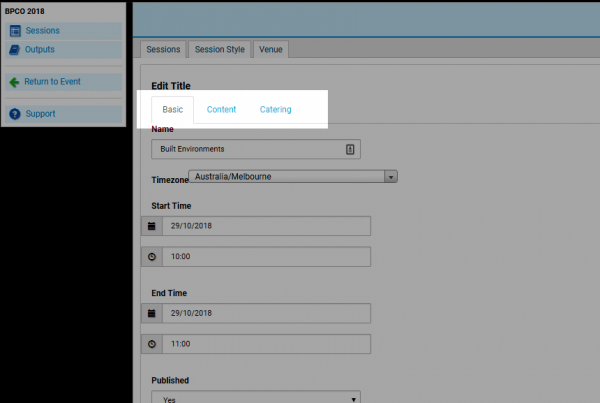 To add an abstract to the session, click on the Session Name from the abstract table and select the ‘Add to session‘ tool. A list appears showing all existing abstracts which have been assigned to the session’s topic/subject Category. To add an abstract from the list, hover your mouse above the chosen abstract and click the ‘+‘ (add) button to the RHS. 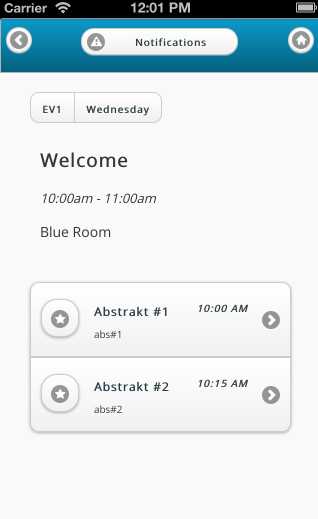 Abstracts can be arranged/ordered within the session by clicking-and-dragging the UP/DOWN arrows icon shown below. The duration and question time for each abstract can be edited by clicking on the value/number shown in the table (as shown below). In the same fashion as abstracts, your sessions can be arranged/ordered by clicking-and- dragging the UP/DOWN arrows icon shown below. Once all session information is added and abstracts have been allocated and arranged/ordered within them, the sessions can be finalised. Finalising a session will allocate numbers to all the abstracts in chronological order. Please note: The finalisation action is not reversible and should only be made when all the sessions are completed. 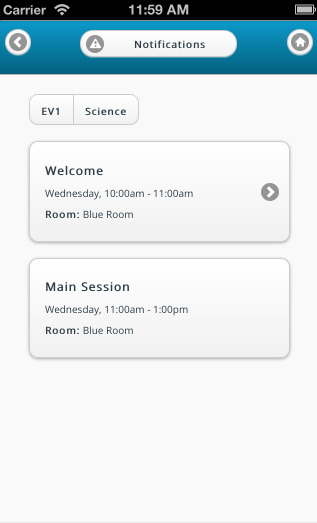 Once sessions have been added they can be selected from within the event app and their assigned abstracts can be viewed.